1943, Winter 1952, Winter 1953, Summer 1955, Summer 1956, Winter 1959, Summer 1962, Summer 1964, 1965, 1966 and 1967. Of the CVs between 1969 and 1989, only 1973 has been reissued. Since 2017, Crecy Publishing have taken over the publication of all new reissues. 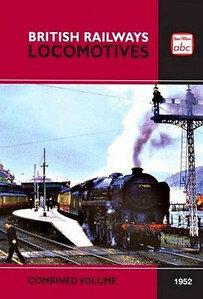 1944 British Locomotives,Combined Volume (1992 reissue), published June 1992, 208pp £6.95, ISBN 0-7110-2113-9, no code. This first reprint carries the Ian Allan 1942-1992 commemorative logo on the cover, which features the original drawing of a 'King' and a 'WC', as used on some of the Winter 1953 editions. 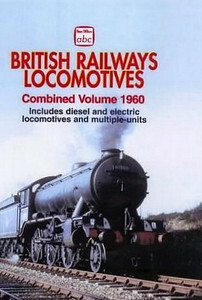 1944 British Locomotives, Combined Volume (1993 reissue), published April 1993, 208pp £6.99. ISBN 0-7110-2113-9. This edition had a number of versions, the first has the IA logo on the spine; printed at the same time, & coded CN2108, another version doesn't have the spine logo. BCA (book club) reprints from April 1993 carry no code. This edition was again reprinted in February 2001, with copies both with & without the IA spine logo both carrying ISBN 0-7110-2113-9. The price by now had reached £9.99. 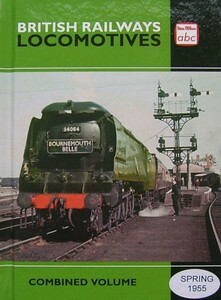 1944 British Locomotives, Combined Volume (1993 reissue), 2nd Impression, published April 1993, 208pp £6.99. ISBN 0-7110-2113-9. This edition had a number of versions, the first has the IA logo on the spine; printed at the same time, & coded CN2108, another version doesn't have the spine logo. This is entirely the result of fading, and I've included it here just in case anyone should chance upon such a book, and would like to know just what it is they've got. BCA (book club) reprints from April 1993 carry no code. 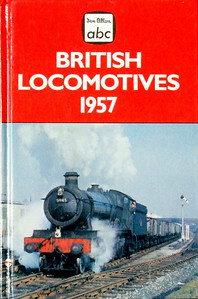 1948 British Railways Locomotives, Combined Volume (1966 reissue), published November 1966, 248pp 15/-, code: EXX/1166. Issued as part of the 'Transport of the Forties' series, this was reprinted in March 1969, SBN 7110-0088-3, code: EXX/369, price still 15/-. Textured dust sheet, off-white, with photo of a GWR 'King' class 4-6-0; being printed 3 years apart, the rear dust covers were completely different. 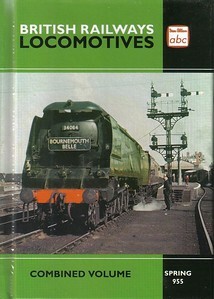 1948 British Railways Locomotives, Combined Volume (1966 reissue), published November 1966, 248pp 15/-, code: EXX/1166. This was an accident: the book was assembled in the wrong order, some of the WR was transposed with ER locos; a large number of these books were produced, too many to withdraw, apparently, and many copies had a manually altered dust sleeve, which shows a 'King' 4-6-0. Textured dust sheet, off-white. 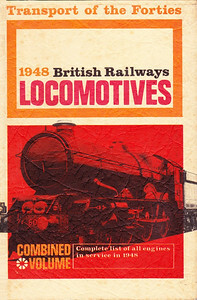 1948 British Railways Locomotives, Combined Volume (1966 reissue), published November 1966, rear of white dust jacket, with code EX/1166 inside. 1948 British Railways Locomotives, Combined Volume (1966 reissue), March 1969 reprint, rear of off-white dust jacket, with code EX/369 inside. 1948 Combined Volume (November 1966 reissue) minus dust jacket, dark tan coloured. 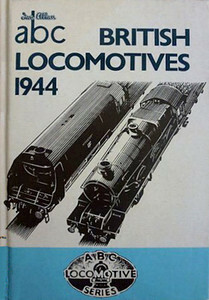 '1948 British Railways LOCOMOTIVES' in two lengthways lines in silver, and 'IAN ALLAN' horizontally at the bottom of the spine. No text or logo on the front cover. This example is the accidentally transposed edition. 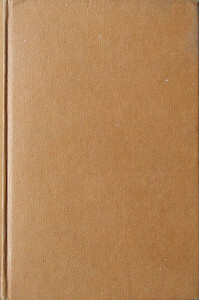 1948 Combined Volume (March 1969 reissue) minus dust jacket, buff coloured. 1948 British Railways LOCOMOTIVES in two lengthways lines in silver, and IAN ALLAN horizontally at the bottom of the spine. No text or logo on the front cover. Although this copy is much lighter than the previous example, it is definitely NOT a result of fading. 1948 British Railways Locomotives, Combined Volume (1972 reissue with 1950 Locoshed), published September 1972, 362pp £1.50, ISBN 0-7110-0401-3, code 10379/DM/972. Reprinted August 1973, same except code 1619/CM/873; also £1.50. Second reprint in March 1975, code 577/DM/375, cost now £2.25. Third reprint in September 1977, code DX/0977, and price increased to £2.75. All reprints carry photo of 50630 & 48117 on the dust sleeve, beneath which the cover itself may be dark green (1972) or black (1975 + 1977). Apart from the ISBN & printer's details at the end, there is nothing in any of these reissues to tell them apart, all relevant text (code & price) being on the dust jacket. 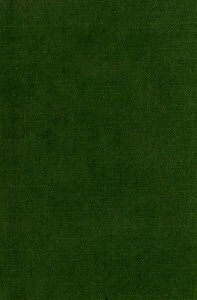 1948 Combined Volume (September 1972 reissue with 1950 Locoshed) minus dust jacket, dark green. 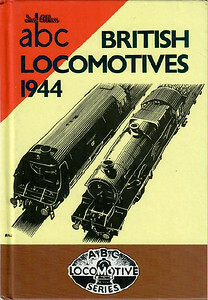 '1948-50 British Railways Locomotives' printed horizontally in silver, and 'IAN ALLAN' horizontally at the bottom of the spine. No text or logo on the front cover. 1948 Combined Volume (March 1975 & September 1977 reissues with 1950 Locoshed) minus dust jacket, black. 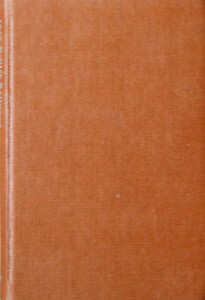 '1948-50 British Railways Locomotives' printed horizontally in gold, and 'IAN ALLAN' horizontally at the bottom of the spine. No text or logo on the front cover. 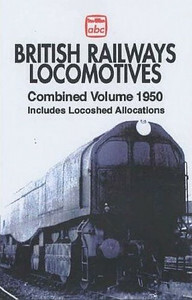 1948 British Railways Locomotives, Combined Volume plus 1950 Locoshed. Published February 2000, 348pp £9.99, ISBN 0-7110-0401-3, code 0002/B2. Two versions appeared, one with the price on the rear cover, the other without, both carry the same ISBN & code; the BCA book club version carries no price, ISBN or code. Cover shows A4 60028 in BR blue livery. 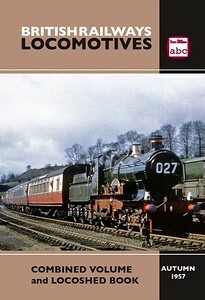 1949 British Railways Locomotives, Combined Volume (2012 reissue), to be published June 2012, 302pp £12.99, ISBN 0-7110-3734-5, code 1206/B. Cover photo of ex-LMS 'Patriot' Class 4-6-0 45531 "Sir Frederick Harrison" in early BR apple green livery. 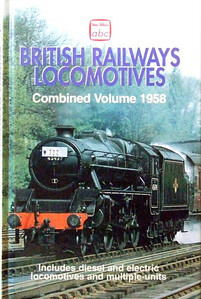 1950 British Railways Locomotives, Combined Volume (2005 reissue), published April 2005, 352pp £10.99, ISBN 0-7110-3106-1, code: 0504/B2. Photo of 'Leader' 36001 in grey primer on cover. Summer 1951 British Railways Locomotives, Combined Volume (2002 reissue), published January 2002, 250pp £9.99, ISBN 0-7110-2874-5, code: 0201/C. A BCA edition was issued; this carries no ISBN or code. Cover photo is of 'Britannia' Class Pacific 70004 "William Shakespeare" working the 'Golden Arrow'. 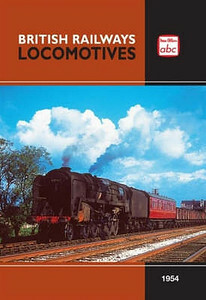 Summer 1952 British Railways Locomotives, Combined Volume (2009 reissue)), published December 2009, 320pp £12.99, ISBN 0-7110-3489-3, no code. Cover photo of what appears to be 'Clan' 4-6-2 72001 at Fort William. NOTE: once again, this particular cover doesn't appear to have been utilised except for publicity photos; see the next photo for the actual printed book. 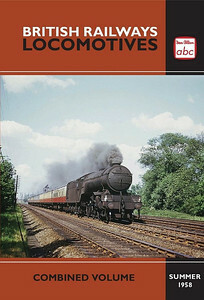 Summer 1952 British Railways Locomotives, Combined Volume (2009 reissue), published December 2009, 320pp £12.99, ISBN 0-7110-3489-1, no code. Cover photo of MN 35015 "Rotterdam Lloyd" working 'The Bournemouth Belle". This is the edition which finally appeared on the bookshelves, the 'Clan' cover appears to be for publicity purposes only (again). A 2nd impression was published in 2012. Summer 1953 British Railways Locomotives, Combined Volume (1996 reissue), published March 1996, 240pp £7.99, ISBN 0-7110-2435-9, no code I have two copies of this edition; one carries the price (£7.99) on the back cover, the other is unpriced, and this ISN'T the BCA edition. 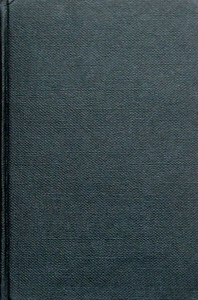 The BCA edition was produced at the same time; as usual, these carried no ISBN, price or code. Cover has photo of unrebuilt 'WC' Class Pacific 34029 "Lundy" at Eastleigh MPD. 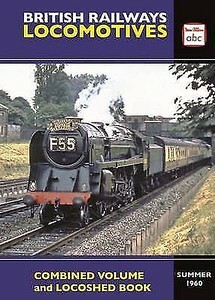 Summer 1954 British Railways Locomotives, Combined Volume (2008 reissue), published October 2008, 284pp £12.99, ISBN 0-7110-3330-6, code: 0810/B2. NOTE: once again, this particular cover doesn't appear to have been utilised except for publicity photos; see the next photo for the actual printed book. Summer 1954 British Railways Locomotives, Combined Volume (2008 reissue), published October 2008, 284pp £12.99, ISBN 0-7110-3330-6, code: 0810/B2. Cover photo shows ex-LMS 2MT class 2-6-0 46502. Spring 1955 (Winter 1954) Combined Volume (2014 reissue), published June 2014, 280pp £13.00, ISBN 0-7110-3799-1, no code. Cover photo of unrebuilt Bulleid 'Battle of Britain' Class Pacific 34064 "Fighter Command" at the head of 'The Bournemouth Belle'. This first batch of this reissue had a misprint on the front cover: 'Spring 955'. Spring 1955 (Winter 1954) Combined Volume (2014 reissue), published June 2014, 280pp £13.00, ISBN 0-7110-3799-1, no code. Cover photo of unrebuilt Bulleid 'Battle of Britain' Class Pacific 34064 "Fighter Command" at the head of 'The Bournemouth Belle'. This first batch of this reissue had a misprint on the front cover: 'Spring 955'. Presumably some were left after the corrected stcock was exhausted, and have been released with a sticker covering the error, as seen here. Spring 1955 (Winter 1954) Combined Volume (2014 reissue), published June 2014, 280pp £13.00, ISBN 0-7110-3799-1, no code. Cover photo of unrebuilt Bulleid 'Battle of Britain' Class Pacific 34064 "Fighter Command" at the head of 'The Bournemouth Belle'. Typing error resolved. 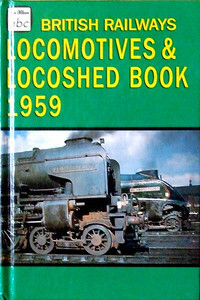 Winter 1955 British Railways Locomotives, Combined Volume & Locoshed Book, published January 1974, 378pp £1.75, ISBN 0-7110-0506-0, code: 1747 GEC 174. Dust jacket carries photos of 46239, 60131. Reprinted June 1976, 378pp £2.50, code: EX/0676, same ISBN, covers etc. 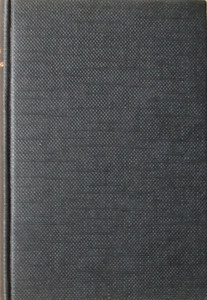 1955 (Winter) Combined Volume (January 1974 reissue with Locoshed) minus dust jacket, black. 'B. R. Locomotives and Locoshed Book 1955' written horizontally in silver across the spine, with 'IAN ALLAN' across the bottom. No text or logo on the front cover. 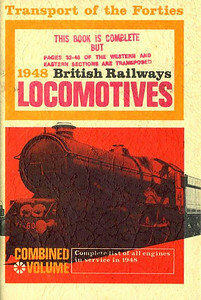 Winter 1955 British Railways Locomotives, Combined Volume (1999 reissue with Locoshed), published March 1999, 378pp £9.99, ISBN 0-7110-0506-0, code: 1747 GEC 174. Cover photo of 'Schools' Class 4-4-0 30932 "Blundells". Although not mentioned in the title, internally this is exactly the same as the 1974 & 1976 reissues, complete with Locoshed Book. This edition appeared as both priced & unpriced versions, both with same code; a BCA version also printed at the same time. It should be noted that on (unnumbered) page 23, the lower captions for GWR locos 36 and 44 are missing; the captions are NOT missing from the original 1955 edition OR the 1974 & 1976 reissues. Winter 1956 British Railways Locomotives, Combined Volume (2011 reissue), published July 2011, 264pp £12.99, ISBN 0-7110-3655-0, code: 1107/B2. Cover photo of U1 Class 2-6-0 31898 at Southampton Central. This reissue was reprinted in 2012; strangely, the code for this is the same - 1107/B2, although it is stated that it's a 2012 reprint. Summer 1957 British Railways Locomotives, Combined Volume + Locoshed (2016 reissue) published February 2016, 360pp £13.50, ISBN 0-7110-3845-7, no code. Interestingly, although ALL images of this cover I've found online are marked Autumn 1957 (no doubt to fit in with the Autumn 1957 Locoshed which is included - see following photo), THIS is the actual published book, with 'Summer 1957' on the cover, which is laminated, with a photo of ex-GWR 'City' Class 4-4-0 3440 "City of Truro" at Ruabon. Summer 1957 British Railways Locomotives, Combined Volume + Locoshed (2016 reissue) published February 2016, 360pp £13.50, ISBN 0-7110-3845-7, no code. Interestingly, although ALL images of this cover I've found online are marked Autumn 1957 (no doubt to fit in with the Autumn 1957 Locoshed which is included), the actual published book shows 'Summer 1957'. Laminated cover (see previous photo), with photo of ex-GWR 'City' Class 4-4-0 3440 "City of Truro" at Ruabon. Winter 1957 British Locomotives, Combined Volume (1993 reissue), published November 1993, 240pp £6.99, ISBN 0-7110-2203-8, no code. Cover photo of WR 'Hall' Class 4-6-0 5945 "Leckhampton Hall"; 'Combined Volume' strangely omitted from the book title. Unpriced BCA edition also printed at the same time. The foldout V Welch painting of 46257 "City of Salford" which was in the original book is not included in this reissue. 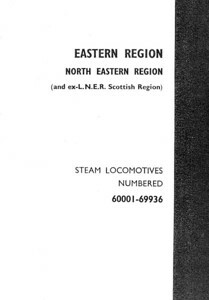 Eastern Region & North Eastern Region divider as in Winter 1957 Combined Volume (1993 reissue); all four dividers were merely photographed in monochrome for the reissue, and are all printed on regular paper, as opposed to the coloured card inserts of the original (see Section 003). Summer 1958 British Railways Locomotives, Combined Volume (2013 reissue), published August 2013, 240pp £12.99, ISBN 0-7110-3769-4, no code. Cover photo of LNER V2 2-6-2 60947. My particular copy has a non-laminated cover; others are laminated. Note: on the unnumbered page 55, the bottom photo of 75029 is missing its caption. It is captioned in the original. Winter 1958 British Railways Locomotives, Combined Volume (2003 reissue), published January 2003, 352pp £10.99, ISBN 0-7110-2976-1, code: 0301/B2. Cover photo of LMS 'Black 5' 4-6-0 45439. Unlike my original book from 1958, the photographic pages in the reissue are in the correct order. In the original, the photo pages have seemingly been placed in a random fashion, as opposed to WR, SR, LMR, ER, etc. Summer 1959 British Railways Locomotives, Combined Volume & Locoshed Book, published July 1976, 326pp £2.50, ISBN 0-7110-0726-8, code: GE/0776. Photos of 45605 + 31632 on dust jacket front. Oddly, although only one publishing date is given, this reprint was priced at both £2.50 and £3.50, the only difference being the price printed on the dust jacket. A further reprint was produced in September 1983, exactly the same, but priced £3.95, and coded CE/0983. Summer 1959 Combined Volume (July 1976 reissue with Locoshed) minus dust jacket, black. 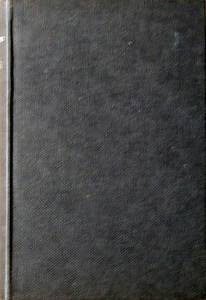 'BR Locomotives and Locoshed Book' printed horizontally in silver on the spine, with 'IAN ALLAN' horizontally across the bottom. No text or logo on the front cover. Summer 1959 Combined Volume (September 1983 reissue with Locoshed) minus dust jacket, black. 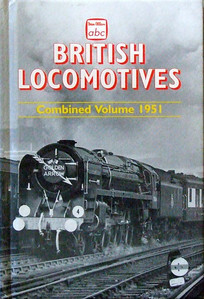 'BRITISH RAILWAYS LOCOMOTIVES & LOCOSHED BOOK 1959' printed along the spine in three lines, in gold text, with gold IA logo above 'IAN ALLAN' horizontally, black in gold rectangle. No text or logo on the front cover. Summer 1959 British Railways Locomotives, Combined Volume & Locoshed Book, published March 1995, 326pp £7.99, ISBN 0-7110-0726-8 (I've also seen this book with ISBN 0-7110-2352-2), code not known at this time. Cover photo of A1 & A4 Class Pacifics. BCA edition produced at the same time, coded CN 3117 (only some BCA books have codes) with ISBN 13 code 9-780711-023529. Summer 1960 Combined Volume + Locoshed Book, published (by Crecy) September 2017, 360pp £13.50, ISBN 0-7110-3864-3. Laminated cover photo of 9F 2-10-0 92220 "Evening Star" at the head of 'The Capitals United Express' passing Ealing. This published cover differs slightly from the promo image (see following photo), mainly in the to right-hand logo. 'Ian Allan' doesn't appear on the printed book, only 'abc Crecy' - Crecy being the new publishers..
Summer 1960 Combined Volume + Locoshed Book, published (by Crecy) September 2017, 360pp £13.50, ISBN 0-7110-3864-3. Laminated cover photo of 9F 2-10-0 92220 "Evening Star" at the head of 'The Capitals United Express' passing Ealing. This is a promo image; the published cover has 'abc Crecy' as the top right-hand logo; this has 'Ian Allan abc'.